PHI Treatment System ensures food safety. Providing 360Â° surface application on all exposed surfaces, PHI Food Surface Sanitation Tunnel Treatment System delivers 99.9% surface microbial reduction. Tunnel design has bead blast finish, NEMA enclosures for electrical ballasts, lamp status indicators, optimized heat vent, and lamp and connection design thatÂ provides watertight seal. PhotohydroionizationÂ® process does not affect taste or appearance of product, and tunnel can totally treat product surface without use of chemicals. RIVIERA BEACH, FL — RGF Environmental Group continues to add upgrades and customers for its patented PHI Food Surface Sanitation Tunnel Treatment System for processors. First introduced in 2013, the Food Surface Sanitation Tunnel system uniquely provides direct 360-degree surface application on all exposed surfaces resulting in 99.9% surface microbial reduction. Bill Svec, RGF’s VP for Water and Food Products said the changes are “customer driven” to provide users with a more efficient and reliable product. “Since its inception we have continued to market and fine-tune this product to customer specifications,” said Svec. Originally designed for Valley Meats, a high-quality meat processor located in Coal Valley, Illinois, the Food Surface Sanitation Tunnel installation was hailed by industry analysts as a breakthrough in the meat industry’s continuing challenge to employ safe, sanitized systems to treat food products prior to sale and consumption. Dr. Marsden, a professor of food safety and security at Kansas State University and an adviser for the North American Meat Processors Association, said the all-natural photohydroionization® (PHI) is an advanced oxidation technology that acts as an additional strategic intervention for trimmings and sub-primals. The PHI technology allows for the anti-microbial treatment of meat products without leaving chemical residues. 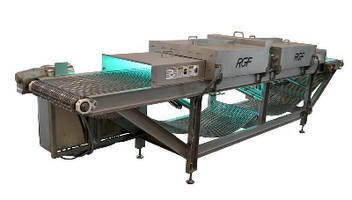 RGF, the U.S. patent holder for PHI-Cell® Technology, has over the last 20 years installed various surface sanitation tunnels used for meat, dairy and fruit and vegetable processors. The PHI technology has been validated for control of Salmonella, Listeria monocytogenes, Escherichia Coli O157:H7 and Staphylococcus aureus, as well as mold, yeast and viruses. RGF manufactures over 500 environmental products and has a 30-year history of providing the world with the safest air, water and food without the use of chemicals. RGF has upgraded their manufacturing plant making the company completely vertical, eliminating the need for outside or overseas vendors allowing them to provide top quality and engineered products at a very low cost. RGF holds numerous other patents and patents-pending and previously invented the Guardian Air PHI-Cell® (Photohydroionization®) and patent-pending REME-Halo™ both for the HVAC industry. RGF’s Advanced Oxidation Systems are proven and tested to be extremely effective in destroying mold, odors, bacteria and viruses while also being completely safe for occupants, and the REME-Halo has the added benefit of reducing particulates. For additional information, please contact RGF Environmental Group, Inc., 1101 West 13th Street, The Port of Palm Beach Enterprise Zone, Riviera Beach, Florida 33404 USA Tel: (561) 848-1826 or (800) 842-7771; Fax (561) 848-9454. Alpet D2 Surface Sanitizer meets NSF and EPA standards. Alpet D2 Quat-Free Surface Sanitizer is suitable for non-porous surfaces.